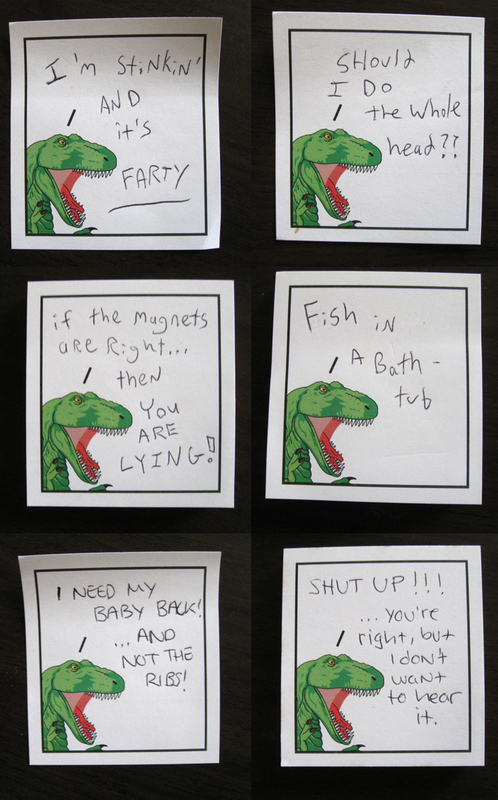 For Christmas Shawn got me these dinosaur post-its from Topatoco, since I love dinosaurs and I use a lot of post-its. Since then, we've been using them to write down some of the random things I say during our various conversations. We don't even remember what context some of these were said in, but regardless, it's a heck of a lot funnier when T-Rex says it. I say the weirdest things sometimes. Also, I thought I'd join Rebecca's Little Facts link-up this week, since I always enjoy reading other folk's Little Facts. "Little Facts are 3 short, factual statements about yourself. It's basically a very simple link-up so we can learn more about each other." Pet Peeve: As a person who has worked many a register, it really bothers me when people hand over crumpled or folded bills. It shows a general lack of respect for themselves and towards the person they're handing money to. I keep my wallet organized by dollar value and always hand over crisp bills. Food: I always start my day off with a bowl of cereal. My favorites are - Frosted Flakes, Honey Nut Cheerios, and Mini Wheats. Guaranteed happy: Seeing people walking their dogs. I can't help but squeal "Puppy!" every.single.time. Ok, this is hilarious. Those are the only three cereals we ever have in our house. Haha. And I'm the same way with dogs. It doesn't matter if they are 11 years old and on their last leg, I always call them puppies! Thanks for stopping by the blog! Our similar cereal habits are uncanny.